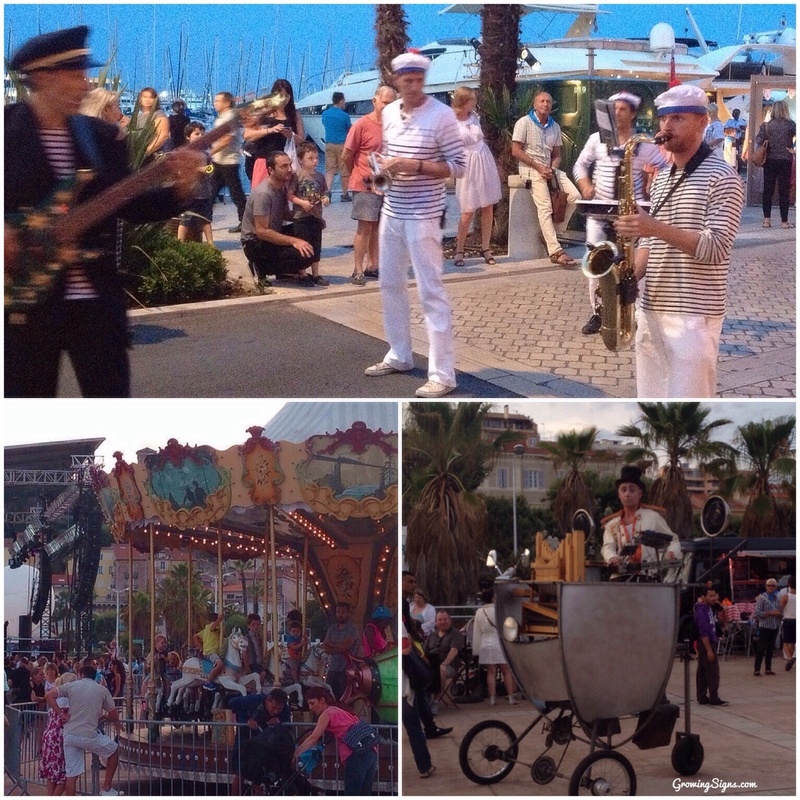 On our second evening in Cannes, families and music lovers were warmly welcomed onto the boardwalk for the second annual Le Port de Cannes en Fêtes, a free festival celebrating summer fun. Why, yes, we’d absolutely love to celebrate in Cannes! We scrubbed up from our beach day and headed to the Esplanade Pantiéro just past the beach where there was a carousel, a picnic area, food trucks, a massive stage and carnival games set up in the seaside square. Scheduled onstage that evening were performances by French music bands Miss America and the Sisters G, and headliners Kool and the Gang. Those of you old enough will remember Kool and the Gang’s huge dance hits from the 80’s like Celebration, Get Down On It, Ladies Night, and ballads like Cherish and Too Hot. Scott and I were thrilled to see them appearing at this free outdoor concert. That song, Celebration, made it on our wedding CD and kicked off the very-important dancing portion at our reception 14 years ago. Who knew they were still touring? But before the sun set and the concerts began, we had time to wander the area and see all the wonderful family entertainment that was set out on the esplanade. 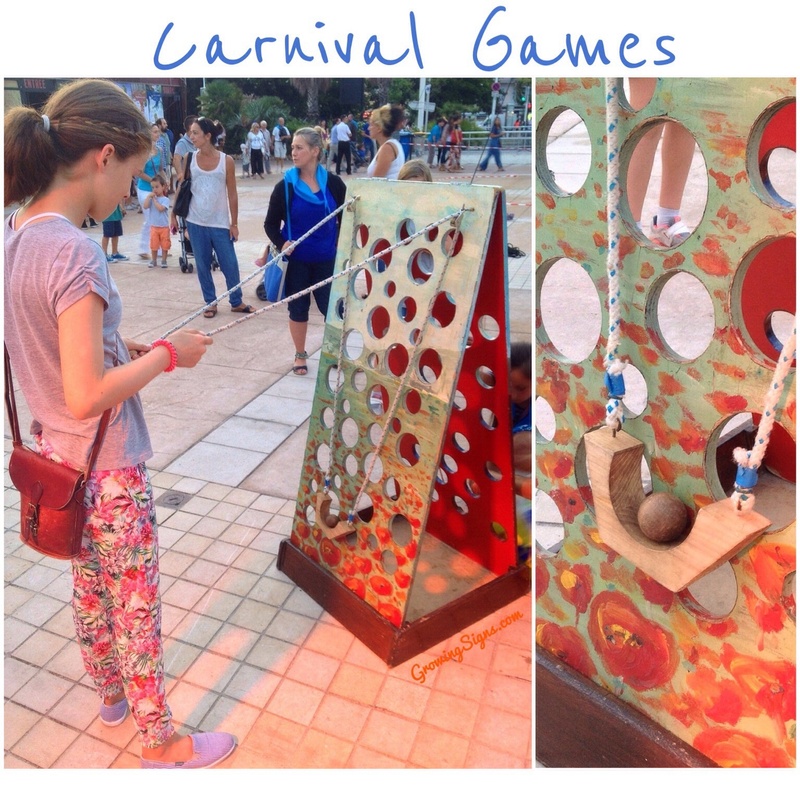 Scott and I quickly realized that the French manage to attain an air of sophistication even with something as simple as carnival games. This first game we saw was very simple but oh, so tricky! With 2 pulleys, you had to balance and manoever the wooden ball up to the top of the board around all the holes without letting it drop. 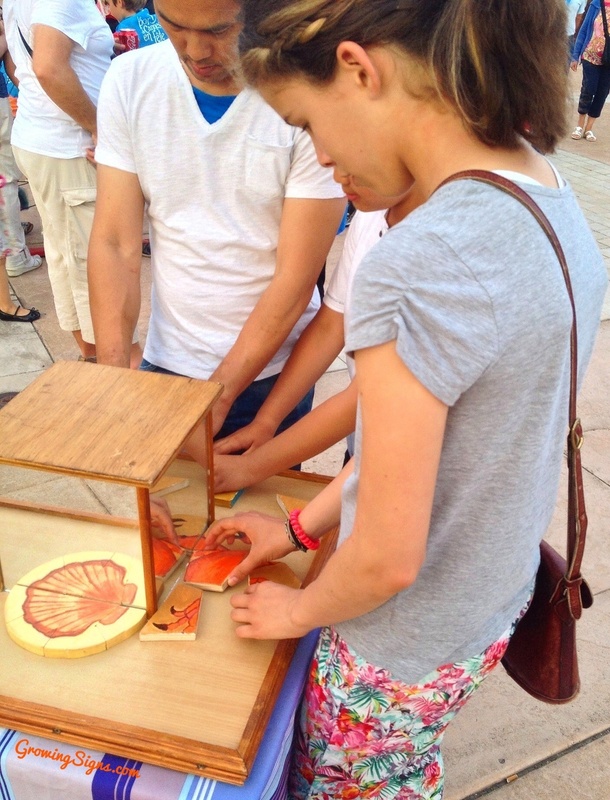 There were so many games to try, and it was very civilized as kids and adults waited their turn to try them all. Line ups weren’t necessary, everyone just watched for who was next. See what I mean about the civilized stuff? This one really tested my own left-handed/right-brain synapses, but Ella found it quite easy to assemble the half-a-picture puzzle pieces into one full picture using the mirror. Nope, none of those silly pay-up-and-give-it-your-best-shot-but-you’ll-never-win kinda games here, and no ratty stuffies as prizes like we’ve always found in our hometown. 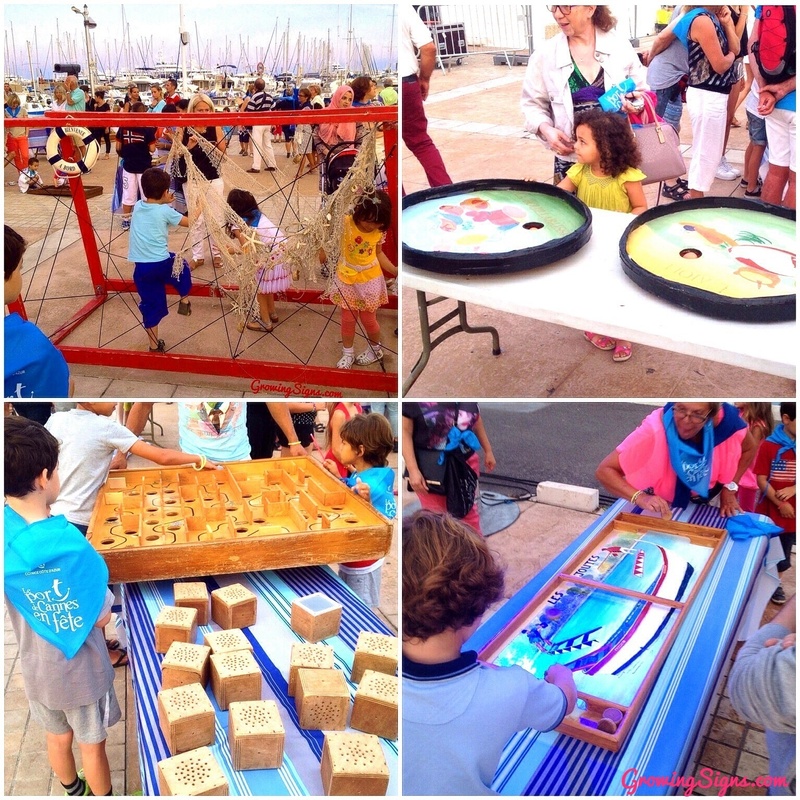 In Cannes, they set up handcrafted wooden games that actually challenge your body and brain, and they’re great for all ages! No prizes necessary, it was just plain fun. My kids and hubby and I had a blast trying out all the free games, and testing our varying levels of hand-eye coordination. We enjoyed watching how other people solved the puzzles, too. Hands down, it was the best carnival I’d ever seen, and I loved seeing it all through my kids eyes as much as I enjoyed participating in such simple pleasures. Street performers, magicians, jugglers, and marching bands passed us by on our way down the esplanade towards the boats in Quai St. Pierre. Then we doubled back towards the square as it started getting dark and we could hear Kool and the Gang taking over the stage. We found out that this concert was a surprise announcement, not on Kool and the Gang’s official touring calendar. 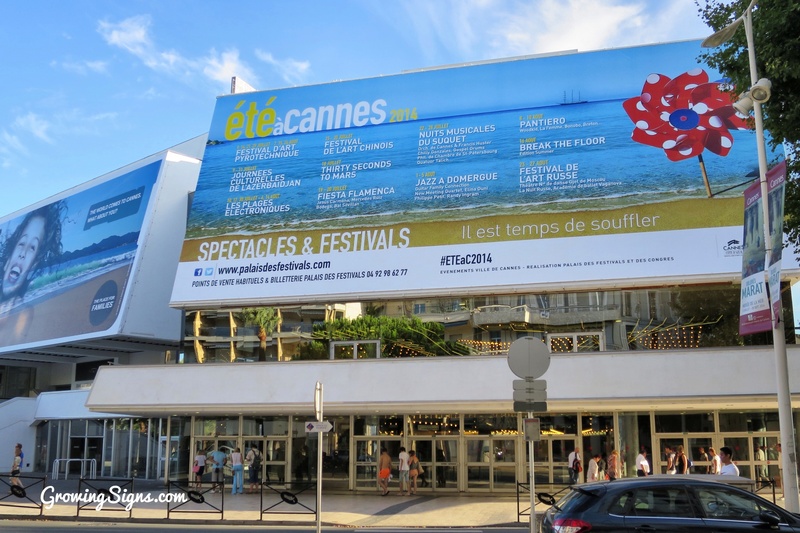 Apparently they love Cannes, too, and added it to their European concert dates this summer. Our kids thought we were nuts, but Scott and I were so chuffed to see them perform and there might have been a little boogie-ing in the streets (cue the eye rolls). I caught a quick pic of the scene as we four regretfully headed back to our apartment from the fête with sleepy, smiley faces. 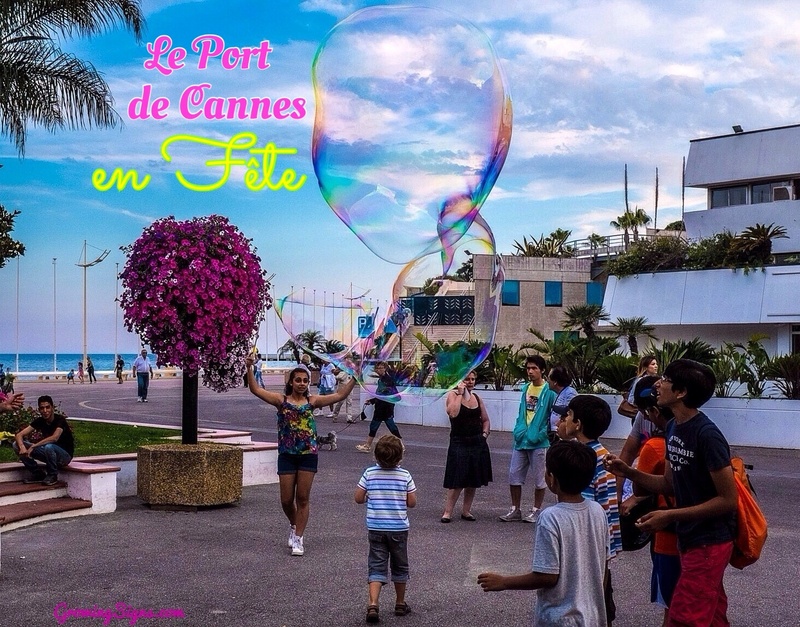 And here’s a great video that shows all the entertainment, games, performers, and Kool and the Gang in action that night at Le port de Cannes en fête 2014. 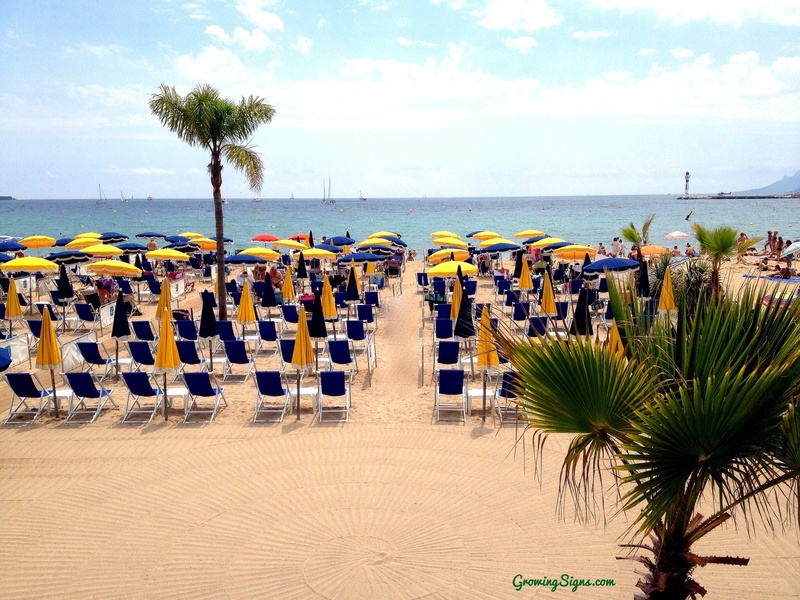 So let’s talk a bit more about the ritzy Cannes beaches that were right across the street from our apartment along La Croisette. Scott and I thought more about the reasoning behind pay beaches, something we hadn’t experienced before and seemed, at first, way too “lifestyles of the rich and famous”. But then we realized that in France, as in many parts of Europe, people don’t really store “stuff”. They typically don’t have sheds, garages, basements or even many closets. Europeans live in much smaller spaces than we are used to in North America. There’s no room for bulky things like beach chairs, umbrellas, coolers, etc. So a pay beach where those kinds of items are provided would be useful to both locals and tourists, and perhaps, even worth their weight in gold (or Euros). So, as I mentioned here, the city of Cannes runs both public free beaches where it’s just empty beach and you bring your own gear, and also pay beaches where there’s a full set up of chairs, umbrellas and tables ready. You just bring your towel, pay for a day or half-day, and then walk in. Very convenient. We didn’t pack any beach chairs in our carry ons, and it is way too hot to sit on the sand in full sun, so we opted to try out the beautiful city pay beach called Plage Macé -around $6 per person for a full day (9am-6pm). Earlier that morning, we had seen many young men and women working hard to set up all the equipment for the day. We were fascinated by the keen effort being made for the visual beauty of the set up. Before opening, they rake the sand for glass and debris, then lay out string in measured lines to make sure all the chairs line up. 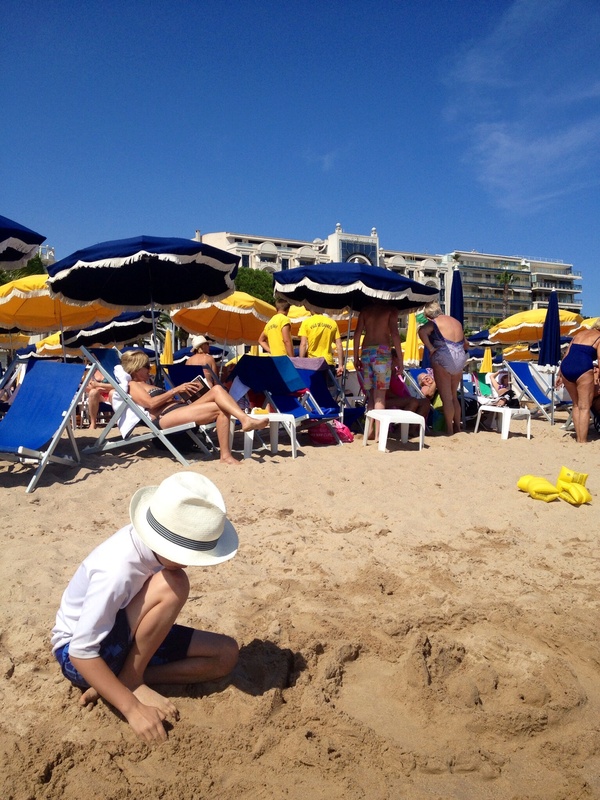 Small beach tables are carefully placed in between the evenly spaced chairs, and then large umbrellas are dug into the sand and placed in colour order -yellow and blue. You just can see in the photo above a young man in turquoise shorts heading to arrange more rows, and the many footprints of the crew going back and forth with the equipment during set-up. Once all the chairs, tables & umbrellas are set up, they rake all the footprints away and lay a grass woven carpet down the middle before opening up for the day. Symmetrical patterns are raked onto the sand on either side of the woven carpet where the footprints had been (look carefully at the photo at the top of this post for swirly sand patterns). Every inch of the beach front was pretty as a picture, and we were gobsmacked. It was absolutely incredible! Feeling quite swish after we paid for a full day, we found chairs near the water line and sat back and enjoyed the hot sunny day. The surf was perfect for kids to play in -not too rough but still lively and fun. We all frolicked in the water, and we tossed a mini-football back and forth in the water. Ian could throw forever, so I eventually figured out how to toss the ball to him in the water while I sat in my lounge chair. Yup, it felt like a vacation to me! 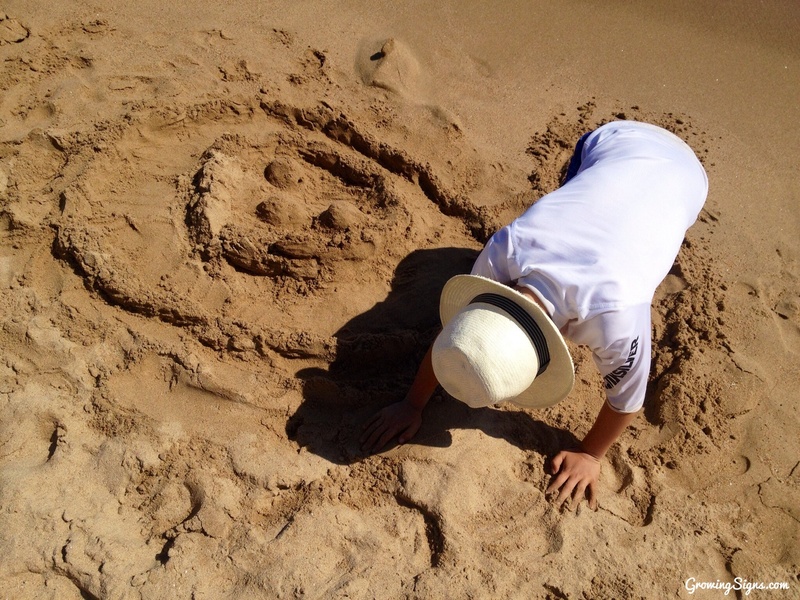 Soon, Ian met a boy visiting Cannes with his family from Italy and they tossed the ball for awhile, and then built some sand sculptures. Because of the language barrier, we asked him to PLAY using the ASL sign, and then a motioning with the ball to show throwing and catching. A bit mish-mash, but it worked! 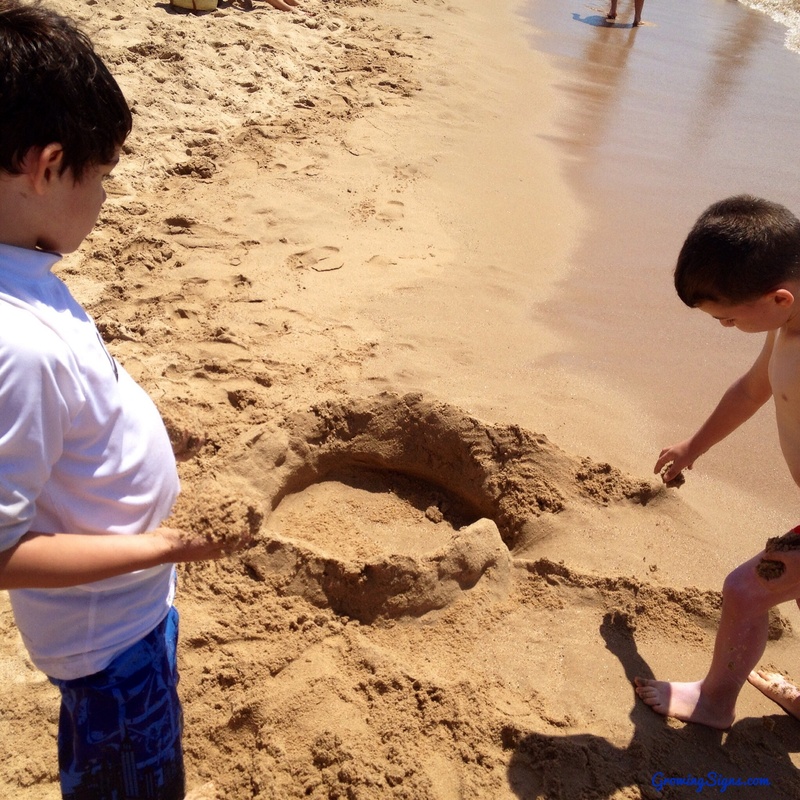 I always love watching what kids will imagine and create in sand -Ian and little Roberto built towns with community gardens and moats and water towers (perhaps memories of the gardens we visited in Tavel?). We were so relaxed and happy to just spend the day doing nothing. As the sun traveled across the sky, people moved their beach chairs and shifted their umbrellas to either face the sun or stay in the shade, and all those measured rows of yellow and blue went askew. The picture perfect set up quickly became a jumbled mess. But still beautiful. We were so very impressed with the way the French approached their job by creating art and beauty within the realm of one sandy beach. 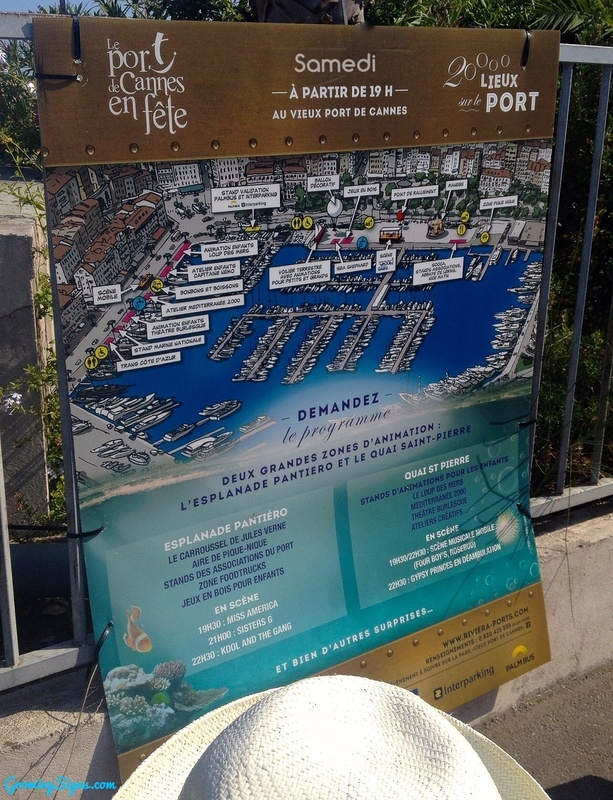 It made perfect sense to our family for Cannes to offer full service beaches alongside the public beaches. The French continued to dazzle us in a cultured, refined, but good-natured way, and we were feeling a kind of punch-drunk love for this sandy corner of France. And we stayed all day at the beach. We wanted to get every minute we paid for! At the very end of the day they take it all down, piece by piece. 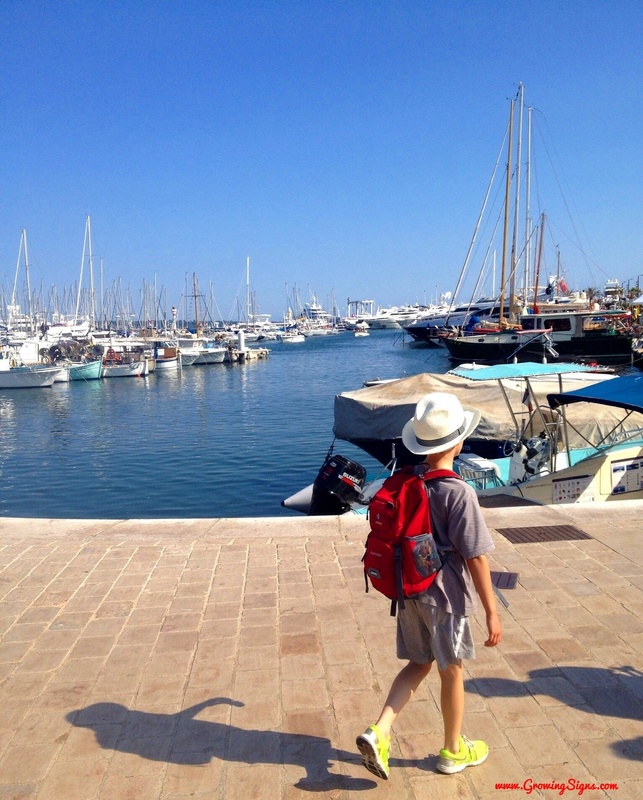 By the end of our first day in the city of Cannes, we were already in love! What’s not to love? 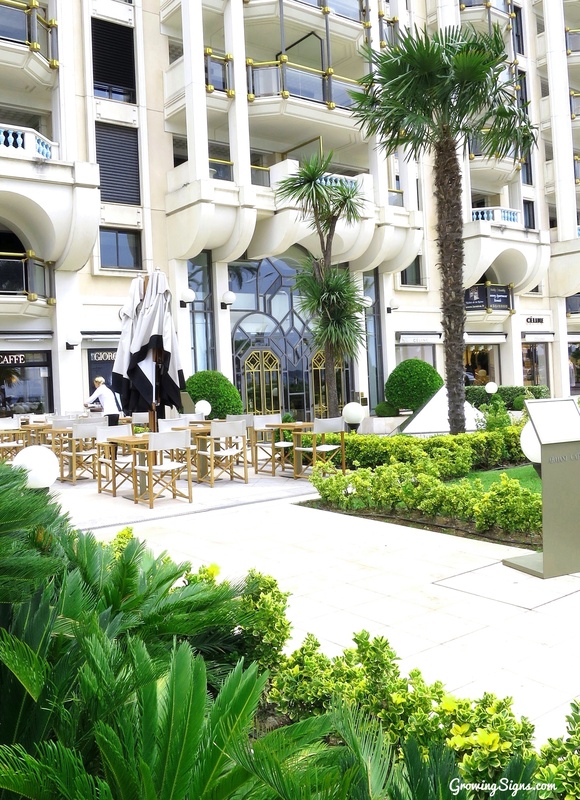 Cannes is located on the southwest coast of France along the Mediterranean Sea, in the French Riviera. Sunny, warm, tropical. All the good stuff, and it’s gorgeous: powder-sand-and-turquoise-sea kind of gorgeous. Staying right on the water overlooking the harbour was incredible, and we watched many cruise ships and yachts sail in and out from our balcony. Gorgeous! The water was cool but not cold. We weren’t dressed for the beach though, and our tummies were rumbling, so we wandered back up to the boardwalk that wraps the entire length of the harbour and began strolling. The harbour was crowded with all sorts of beautiful boats -we loved the sailboats the best, although the rock-star yachts with room for a helicopter to land were pretty dazzling. We soon started looking for a restaurant as we were getting pretty hungry for dinner. There were many cafés to choose from along the water with lovely views of the harbour and boats. It was also very warm outside so we wanted to choose somewhere with a patio that could catch some breeze, but many of the restaurants looked fairly touristy and pricey. Slightly off the main road, tucked behind a fountain was a little place with bright red umbrellas and a small outside patio. There was a larger restaurant next door, but we liked the music we could hear lilting out of the tiny place. We ambled over and saw the owner inside. When we asked to sit for dinner, he laughed. Laughed and laughed and laughed. Then, when he realized we didn’t get the joke, he said, “Come back at 10pm, no one eats dinner at 6:30 in France”. But he promptly laughed again, and said, “Of course, come and eat, you can sit anywhere you like because there’s no one else here”. So despite not planning on serving dinner so early, he welcomed us in properly and proceeded to serve us a meal we won’t forget. So fresh, and lovingly prepared by his chef that we could taste it in every bite. 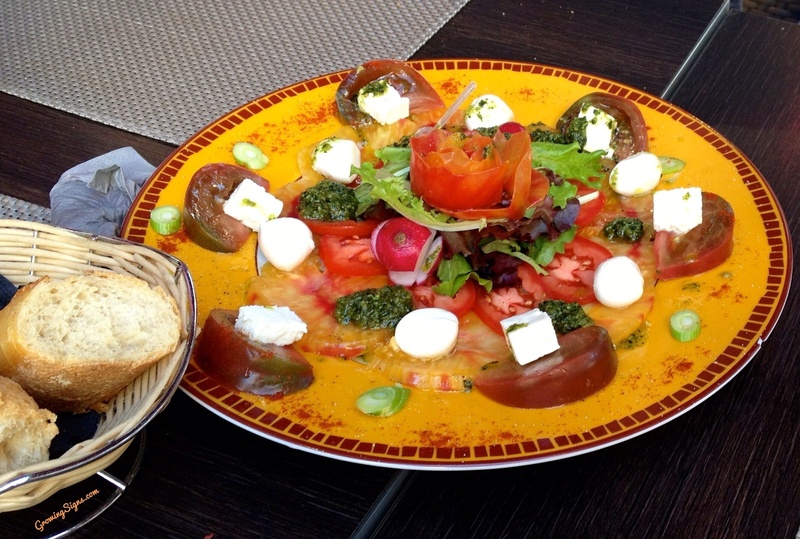 Our starter plate was simply tomatoes and fresh cheese, and even though Scott usually avoids tomatoes, we ended up having fork battles over the last pieces. 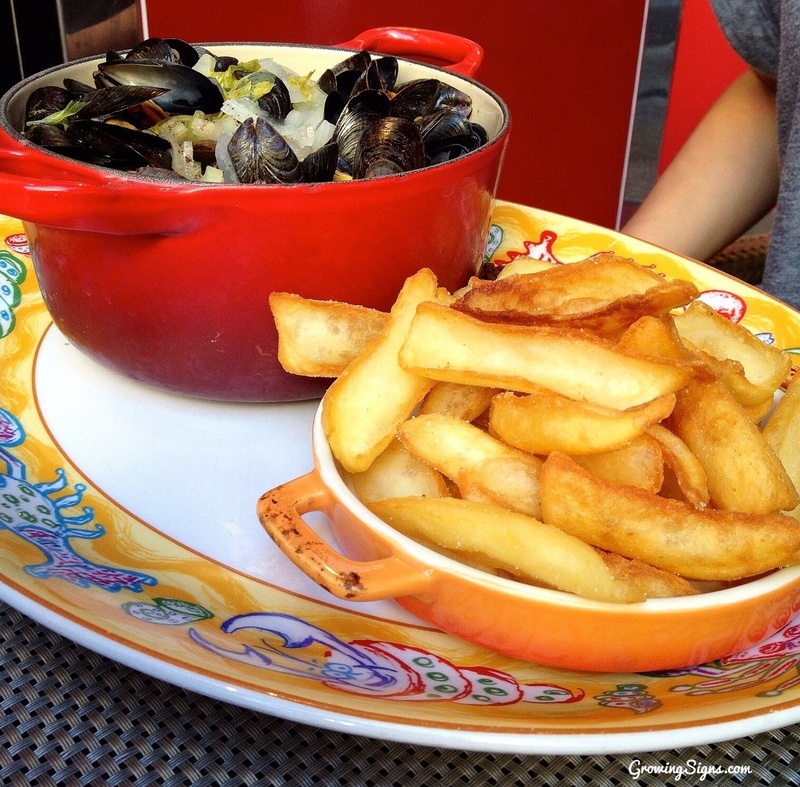 Then our entrées came, and we devoured them: roast chicken, moules frites (mussels and fries) with the most fluffy, crispy French fries that we’d ever eaten. 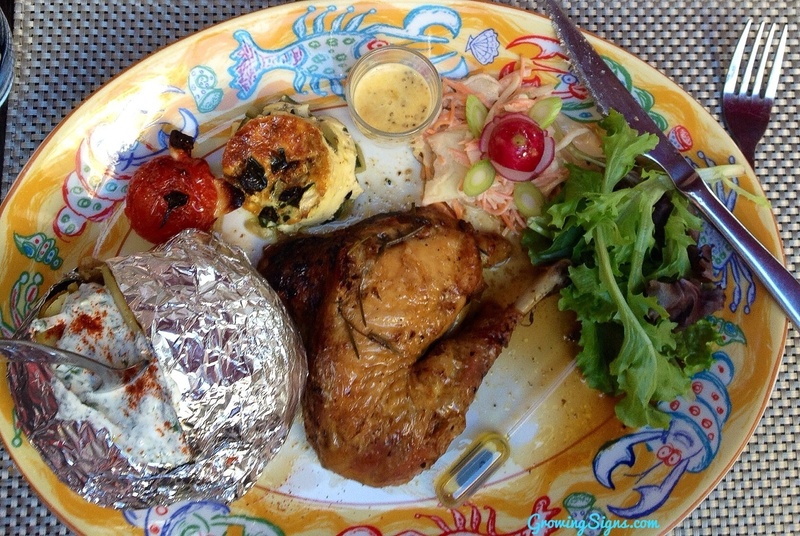 My roast chicken was a house specialty done in their rôtisserie with herbes de Provence, a delicious little vegetable soufflé, and some greens. So very simple, with out-of-this-world flavours. It was delicious, gorgeous, fresh food and we were wiping our plates with the bread. We shared dessert -a sumptuous chocolate molten lava cake -which barely sat long enough to take this photo (the kids, of course, loved the whipped cream with candy sprinkles). We sat on that patio for hours and chatted with the owner. We found out the restaurant had only just opened and he now felt like he was in a second marriage -to his friend, the chef! There wasn’t a lot of time spent at home with his real wife and kids, but luckily he and his family lived upstairs above the restaurant. He was truly charming and quirky, and we all enjoyed his hospitality. He loved to make my kids giggle with silly jokes in English. By the time we finished a lovely bottle of rosé and paid our bill almost 3 hours later, the restaurant was filling up with locals ready for their late dinner -always a good sign. 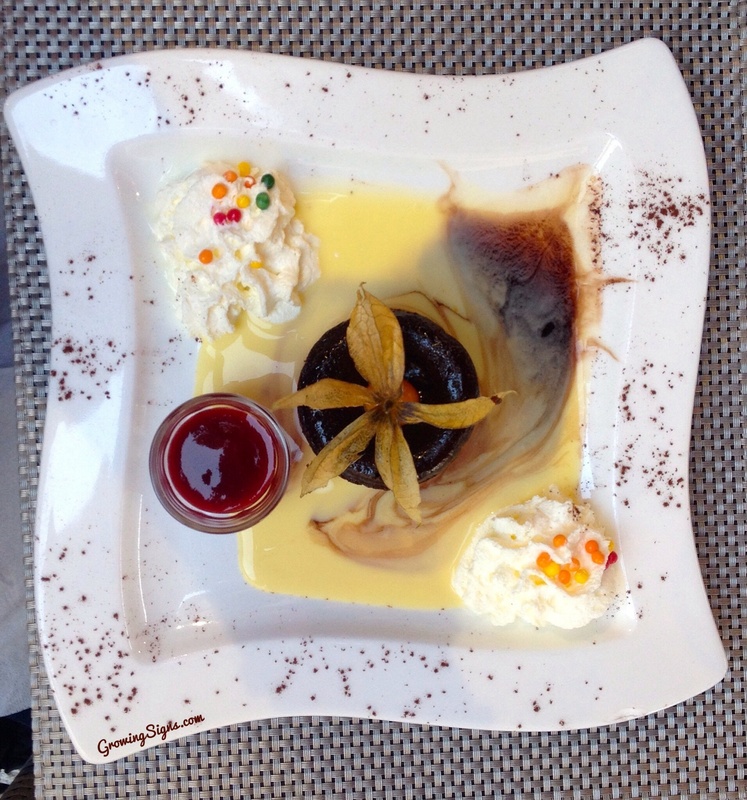 And a perfect start to our week in Cannes. 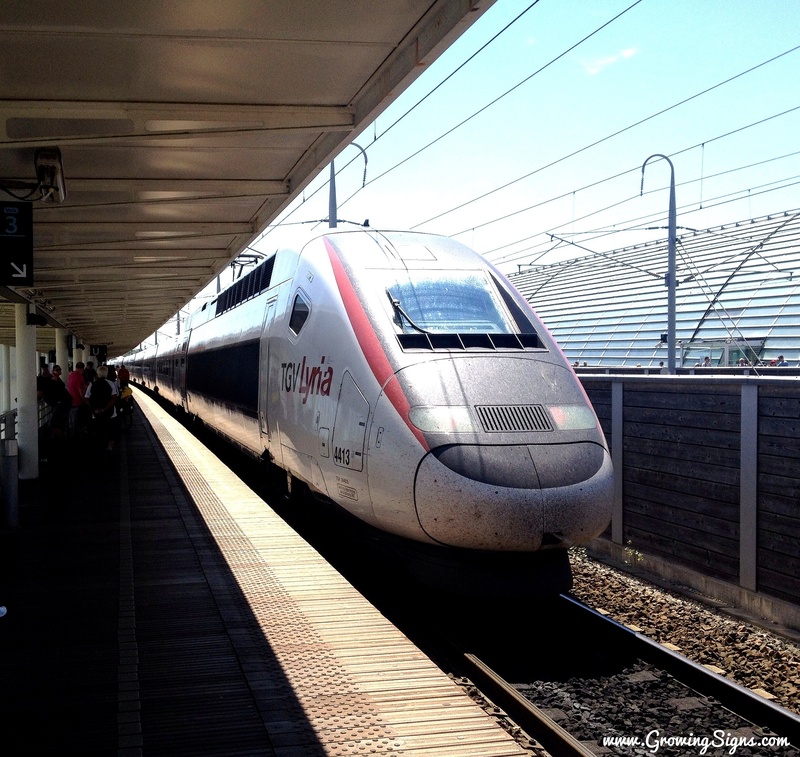 We had a great time in Avignon, but like it or not, we had a train to catch. And actually, we kinda liked it -we were heading to the beach! More specifically, the south coast of France to the gorgeous city of Cannes. 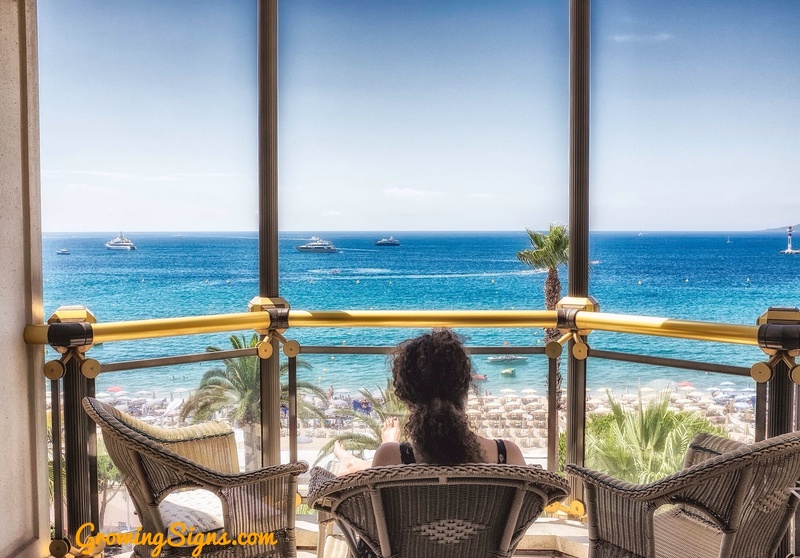 Yes, you’ve probably heard of the Cannes Film Festival and you’ve maybe seen photos of gorgeous yachts in the harbour and glowing celebrities on the red carpet in Cannes. That’s where we were headed! But the film festival wasn’t on, of course. If it was, there wasn’t a hope in heaven for us to find accommodations or even a seat at a restaurant, no matter how early we could book. 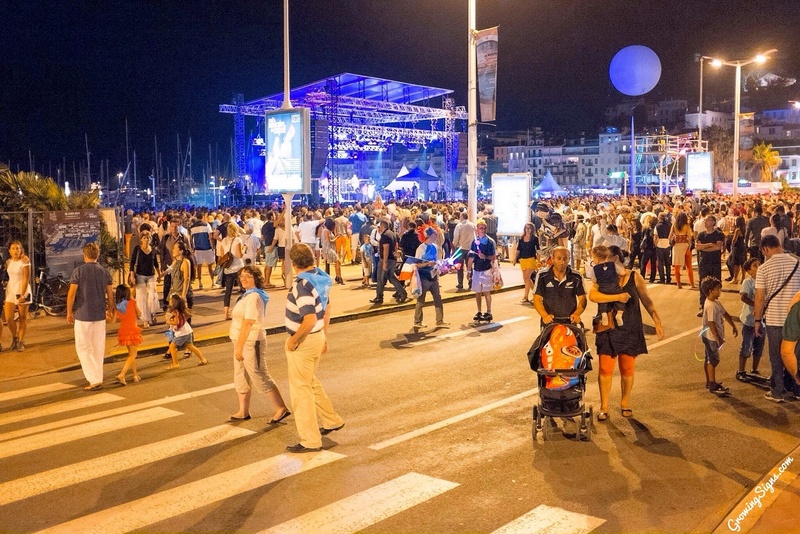 The city fills up entirely with the rich and famous during the film festival in May, and stays busy throughout the summer after that, so luckily we had picked the one week in summer that was slow in Cannes. 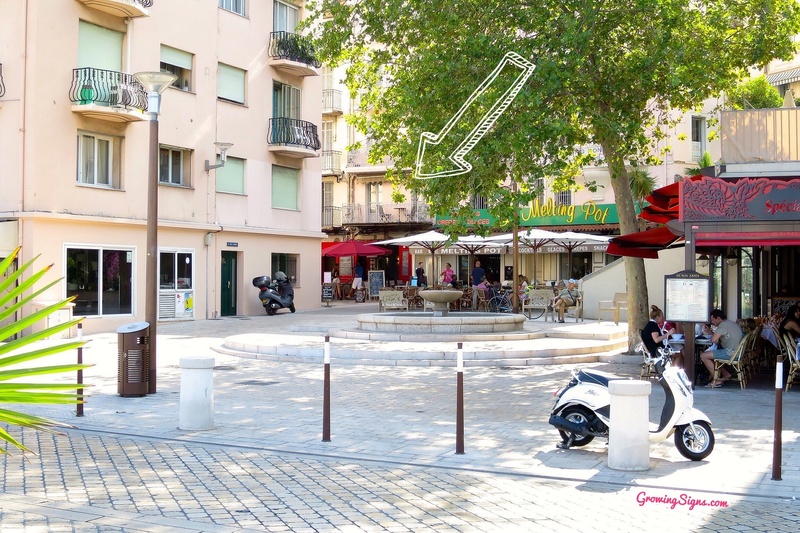 So slow, that we were able to nab an apartment rental smack dab in the middle of the toniest street in Cannes –La Croisette. Which also happens to run along the city’s entire harbor lined with a white sand beach. Oh, la la! Yes, we have friends in all the right places. Back in Vancouver, many months before our trip, I realized that we had a hole in our itinerary and needed a place to stay after Avignon and before our week in Paris. I sniffed around on the internet in the usual places, but then I remembered meeting good friends of friends, Dean and Laurie Horvath, who own Mason Horvath Travel. Their company specializes in planning personally tailored trips for both business and vacation, with all the little touches that make a trip perfect. I remember them describing their last trip to Europe back when we were thinking about visiting our friends in France. I crossed my fingers that they would know of a good place to stay. Bien sur! Turns out Dean and Laurie had been to Cannes many times (they travel the world often with their two young daughters) and knew exactly where to look. I struck absolute gold. 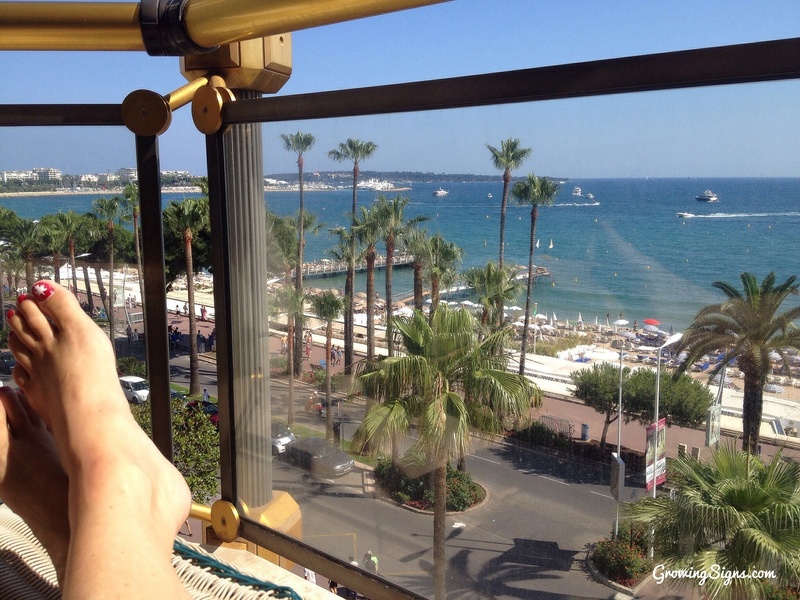 As I mentioned, for some reason, that one particular week in summer was a seasonal low week in Cannes, and Dean was able to secure us a 2 bedroom apartment right on the beach for the dates we needed. Mind you, it was slightly out of our preferred budget, but Scott and I decided to go for it. 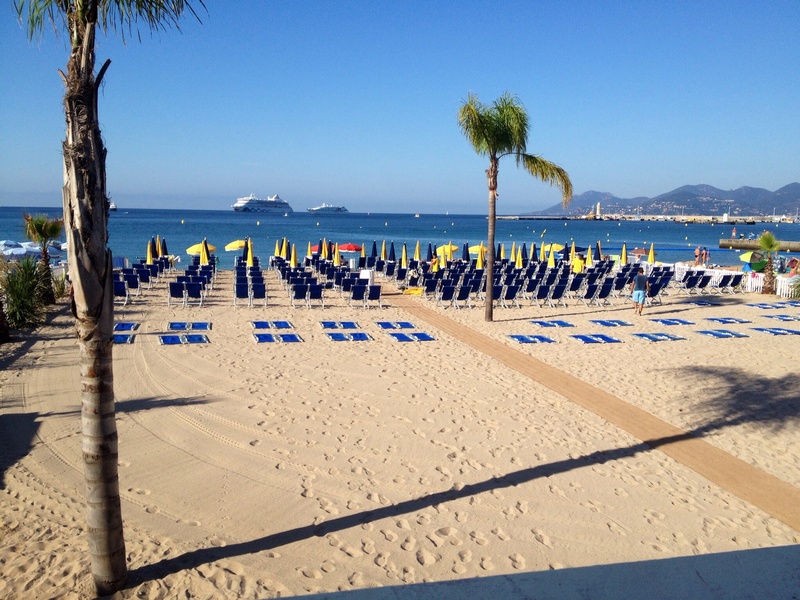 When would we EVER find ourselves in this area again and be able to stay on the beach in Cannes in our lifetime? Yeah, probably never. Decision made. And boy, were we glad we did it! After the 3 hour train ride and a 10 minute schlep through town with our rolling suitcases and backpacks, we followed our noses towards the salty, sea air and located our very glitzy building. Yeah, we didn’t know what to say either! It was breathtaking, and unbelievable, and so completely awesome. Gratitude filled my chest. It felt palpable, like I’d swallowed too quickly. But still, I had no idea places like this existed! All four of us were so excited to go explore Cannes. But can you blame me for dropping my suitcase, backpack and purse and kicking up my feet?